This is not going to be a detailed post. All the code can be found in github at https://github.com/andete/blog-stuff/tree/master/STM32F105 . In my quest for more experience with different microcontrollers I made a little breakout for the ST STM32F105 ARM Cortex-M3 micro-controller. The breakout provides a 8Mhz external clock, which is multiplied by 9 by the internal PLL to give a nice 72Mhz clock. The MCU is programmed with the STLINK V2 programmer via SWD. It should also be possible to program it via DFU but I have not tried that yet. I cobbled some code together from all over the internet to make a simple blink file. // why the check for UIF ? // Set prescaler to 24 000 (PSC + 1) // why? 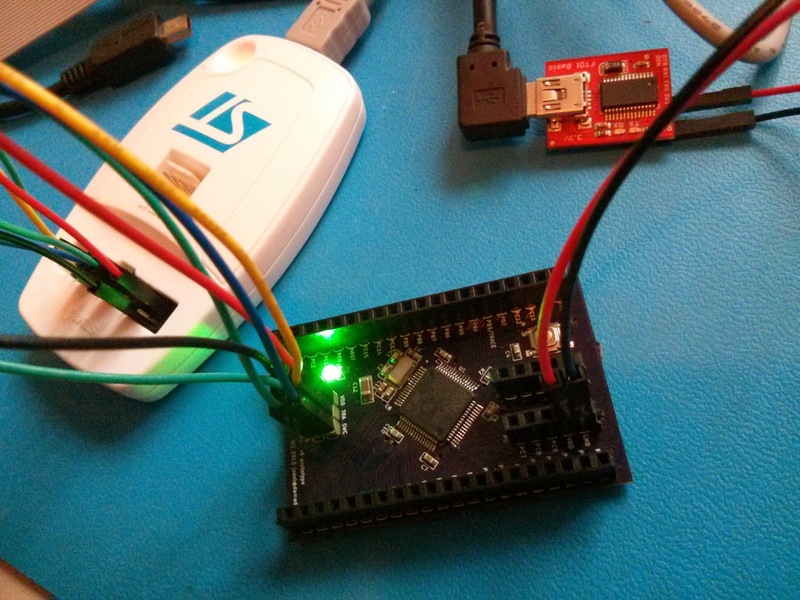 It does blinking via the SysTick interrupt or alternatively via the TIM3 timer interrupt. It is also possible to do this without interrupts at all, just using the timers, but this is not shown here.